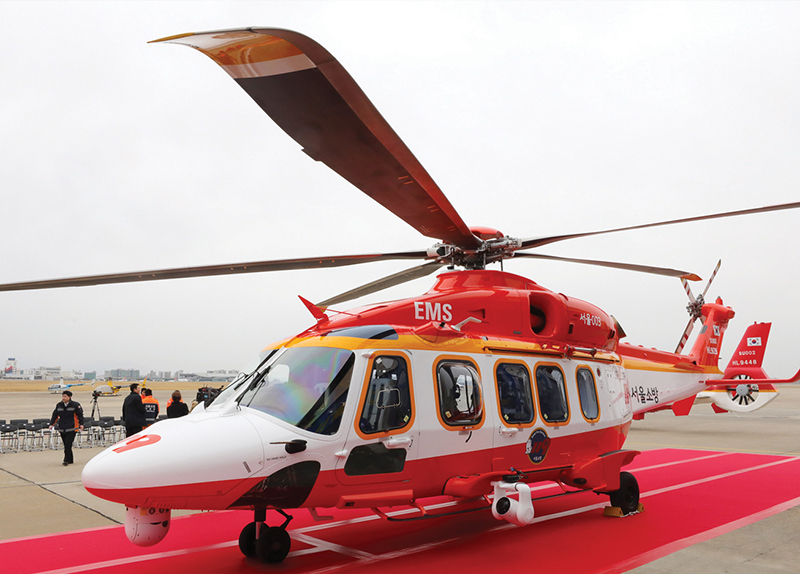 Recently, the launch ceremony of a new helicopter took place in front of the 119 rescue squad building in Gimpo International Airport. During the event, the Seoul Metropolitan Government introduced the helicopter for the first time in the country. It is the AW-189 multipurpose rescue helicopter, which was manufactured by an Italian company called Leonardo. It is a cutting-edge, high-performance 8.3-ton twin-engine chopper that can carry up to 19 people and travel more than four hours at speeds of up to 283 km per hour. As the helicopter is equipped with a defibrillator, artificial respirator, weather radar, and thermal observation systems, it can carry out emergency medical services, search and rescue operations, and firefighting. Most notably, it has a water storage capacity of 2,000 L in its “Bambi Bucket” for firefighting. 1. Where did the launch ceremony for the new helicopter take place? 2. What company manufactured the AW-189? 3. What is considered the most notable feature of the AW-189? 1. Should the general public show interest in non-commercial inventions like the AW-189? 2. What are other ways to improve emergency services? 3. Do you think the introduction of the AW-189 will save more lives? 4. Do you think the government should continue to invest in emergency helicopters?